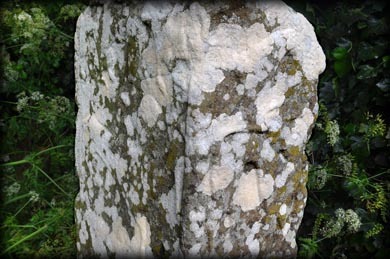 Tybroughney Pillar Stone, Kilkenny . 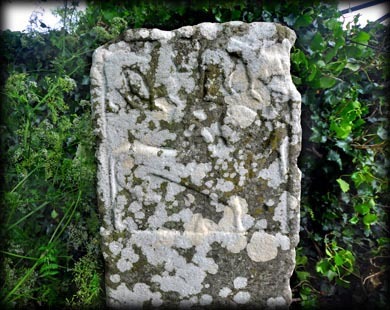 This sandstone cross pillar stands on a 6th century early christian site founded by St Modomhnach. It is 1.1 metres high and 48 cms wide on the E and W faces. The sides are 25cms wide. The pillar, which may have formed a part of a high cross is richly decorated on all sides. The west face, pictured left, features a centaur. On the N face is a Stag with a whippet like creature below. There is also a manticora figure and several other beasts carved on the pillar. 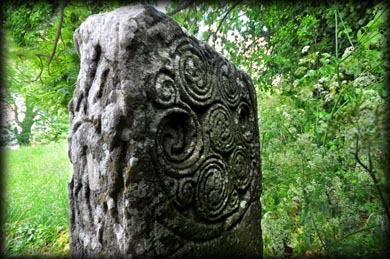 On the East face is a spiral motif with seven spirals ending in birds heads, possibly swans. Please ask landowner for permission. Beneath the cross pillar is a large single bullaun stone. The cross pillar was on my wish list for a long time. I was disappointed with my images and hope to return soon. Situated: From Carrick-on-Suir head east on the N24 for about 2.6 kilometres. Then turn right for Tybroughney. Tybroughney castle is 2 kilometres down here on your right. 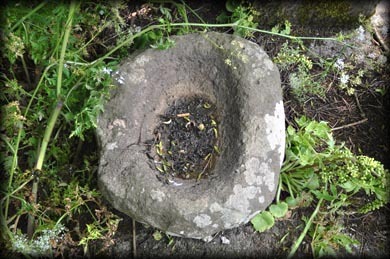 The pillar stone is 250 metres east of the castle. Discovery Map75: S 4410 2150. Last Visit: June 2015.